The first batch of hotfixes for Patch 2.6.0 has arrived. 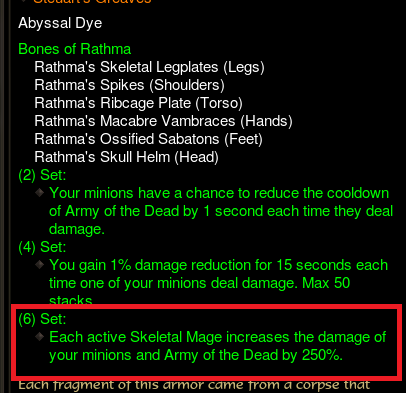 The 6-piece Bones of Rathma set bonus now grants 625% damage to your minions and Army of the Dead skill (up from 250%) for each active Skeletal Mage with a total cap of 2,500%. Players only need to maintain 4 active Skeletal Mages for the 6-piece set bonus (down from 10). Hellcat Waistguard was fixed to drop again. Update: These hotfixes have been delayed to Monday. Last updated July 6. Hotfixes are denoted by the date they were applied to live servers. How it worked before the patch? Each hit from the Bone Armor tornado could proc the effect of the gem? I am a little confused by what they mean "Skeletal Mages are no longer required to maintain the buff"? does that mean once you have summoned 4 to get the 2500 damage bonus you don't need to summon anymore and you stay buffed at 2500 for the remainder of the session? or the buff will last last longer then a mages up time and wear off if another one isn't summoned? Wanted to "Like" Stan's reply but it vanished into thin air! Previously, you needed to have 10 Skeletons up to receive the 6PC bonus. Now it's down to 4.
yes I understand that part, that you only need 4 to receive the max bonus, but it also says they don't have to REMAIN up to keep the bonus active where as before the bonus was only applied if they were active and attacking. I am wondering if this means if the bonus will now be permanent with or with out the mages once all 4 are summoned atleast once. To receive the effect of the 6-piece Rathma set bonus, you now need to maintain an uptime of 4 Skeletal Mages (down from 10). (250*10 = 625*4). Instead of each Skeletal Mage increasing your damage by 250% up to a maximum of 2,500% at 10 Skeletal Mages, a single will increase your damage by 625% and caps at 4 / 2,500%. ohh ok I think I got it now, there saying no more then 4 are needed to maintain the bonus, they just worded it weird like you didnt need to summon mages anymore after the bonus was earned. at first I thought they ment once 4 were summoned the 2500 bonus was permanent with out the need for further mages. To be honest tho I wish the would have changed the way the bonus was triggered because the dam mages take so much recource to summon dont last hardly at all, 6 seconds is nothing, when other set bonuses are triggered practicly all the time by base spells that you are always using and cost nothing. like the bonus could be when you use command skeleton you get the full 2500 bonus untill they kill the target or switch to a new one, wich would line up nice with that set that makes them auto switch targets giving you the increase permant that way, because maintaining 4 mages at all times is really hard when they cost 40 essence a pop and you can only earn 25 or so from attacking. then again I do have that ring that summons 2 ata time so maybe it wont be so bad, only time will tell. You should do lots of damage so white mobs will die from 1-2 hits. Devour Cannibalize would then regen your essence very fast because of lots of corpses around you. The Circle of Nailuj's Evol ring will help, too. (160 essence vs 80 essence for 4 skeletons (4 casts vs 2 casts)). More over, with the ring your mages will last for additional 2-4 secs (so 8-10 in total), which is not that bad. Command Skeletons with Jesseth Skullscythe Jesseth Skullshield should restore your essence pretty fast as well. (it should take ~1 sec to kill white mobs with Command Skeletons). Btw I've tested the Necromancer Bone Storm build and it's still powerful even with the Mirinae, Teardrop of the Starweaver proc fix. "players will only need to summon four (down from ten) Skeletal Mages to receive the full six-piece set bonus. Additional Skeletal Mages can still be summoned to attack your enemies, but aren’t needed to maintain the bonus." The part "not needed to maintain" is in direct reference to the Mages summoned after the bonus is capped. When I look at the set bonuses of my Rathma's set, it still shows that each mage gives 250% bonus. Is this simply text that needs to be updated, or do I need to get a whole new set for this to take effect ? Please keep in mind that some issues cannot be addressed without a client-side patch. Also note that changes to certain abilities will not be reflected in its tooltip until a patch is issued. 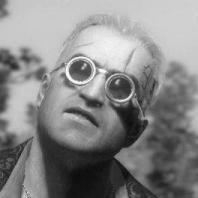 The hotfix is not even live yet (goes live tomorrow, monday). So, @Defman, you might wanna test more tomorrow since nothing has changed yet. I just leveled mine and got the Inarius set yesterday. I was able to complete a 72 with 4 seconds left at 592 paragon points and level 50 marinae / Bane of the Trapped gems. Rolls on gear are almost optimal (probably 85%) and the build is identical to the guide. Not sure what it was like pre-nerf, but I felt a bit squishy and the damage was a bit lower than I would have expected. I would assume that a fresh seasonal with no paragon points and level 25 gems is going to be tough to hit that mark, but I honestly wouldn't know. Curious as to whether the Rathma's set would be better. We're hoping to get the hotfix out to you all as soon as possible. When that happens, we'll update the appropriate thread. In the mean time, let's avoid calling out people on the forums, even "vaguely." It's not healthy for the community, and there are better channels (Customer Support) for such things.